Fast glass bottom DIAMANT can take up to 13 people and it is the only real option for someone with seasickness problem, because the boat is flying over the vawes. Approx. 30% of people feel bad and have a motion sickness. This is the solution! During the short 2 hours trip or during your private charter you can enjoy also underwater life throught the the bige glass bottom of the boat. 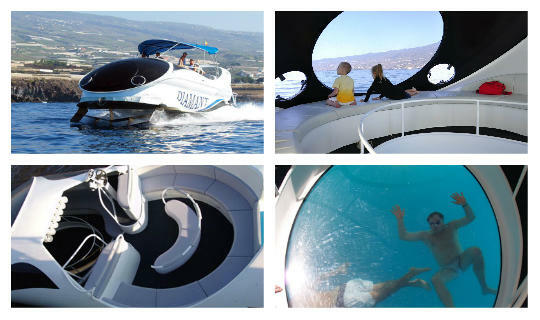 Boat trips by DIAMANT Flying Boat starts from Puerto Colon every day at approx. 10:00 AM, 1:00 PM or 4:00 PM and the boat stuff speak a few languages. In order to make your booking of DIAMANT Flying Boat Boat Trips, Private Charters easy and comfortable Tenerife Host use the most advanced and user friendly booking platform TripsPoint.com where you can easily check last actual prices, the tour availability, required booking deposit and book this tour. To get more information of DIAMANT Flying Boat Boat Trips, Private Charters and do booking, please, click the button ‘Book Now’. You will be taken to the tour page at TripsPoint.com where you can easily book the tour. Once the booking of DIAMANT Flying Boat Boat Trips, Private Charters made at TripsPoint you will get your tour Voucher / booking confirmation with all details, including exact pick-up point, pick-up time, pick-up point map. 30€ – per child up to 12 years old. The price include 2 hours sea trip, a softs drinks or water. 1300€ – per 4 hours. 1950€ – per 6 hours. 2600€ – per 8 hours. Charteing the boat you can take a group from 1 to 13 people.The price include sandwiches and refreshing drinks. You will have to go the harbour in Puerto Colon by yourself. You will get all detailed information from our representative, which will deliver you tickets.